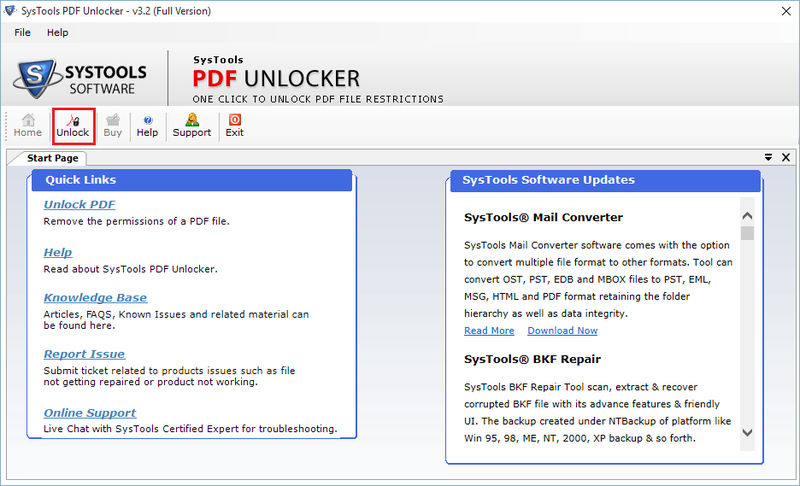 Secure PDF Password Unlocker Software can be easily installed on Windows 10/8.1/8/7/XP or Visita & all below version (32 & 64 bit) Operating System. (32 & 64 bit) OS. Within no time unlocks extremely huge Ebooks PDF files. 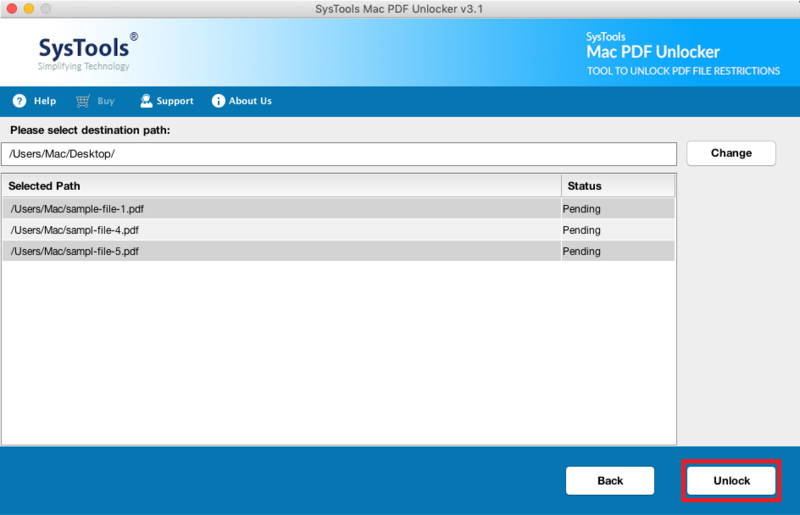 The PDF Unlocker Software facilitates unlocking password protected files. It allows you to remove all types of restrictions such as, extracting, printing, copying, editing from Adobe document. At a time, you can unlock a single file with the single file mode. You can unlock multiple files in batch having a common file restriction or some special restriction using the unlocking software. However, for operation on batch files, the Business or Enterprise License of the PDF Unlocker software needs to be ordered. The PDF Password Unlocker Software facilitates removing the owner level password from files. Also, it allows unlocking the user level password from these files by providing the respective password when prompted. Once unlocked, it will not ask for the password to open. Throughout the unlocking and saving process, the PDF encryption remover tool thoroughly maintains the originality and integrity of the file. It keeps the original formatting and other properties of the files intact. Also, the file attachments are kept as it is. The PDF Security Remover Tool generates a preview in the form of a list of all associated files permissions in an ‘After’ and ‘Before’ column when you browse and add a PDF for unlocking. Once the file is unlocked, the preview of permissions will change accordingly. After the completion of the unlocking process, the PDF Password Unlocker Software provides you with an option to save the resultant at a desired location of your choice or you can also create a new folder directly from the software panel to save the resultant files. Take a Vision on the Steps to Unlock Secured PDF files. Play the Live Demo Video to See Quick Testing of this Tool. Genral Queries of Customers before Purchasing this PDF Password Remover Software. How PDF Password Unlocker Software removes restrictions from secured PDF file? Step2: Click 'Unlock' & Browse the secured PDF File. Step3: Now Click ‘Unlock PDF’ button to remove security from PDF file. Step4: Save the Unlocked PDF file at the desired location. Does the Adobe PDF Unlocker run on the latest version of Windows? Yes. The PDF password remover software to unlock PDF file restrictions is compatible to run on all versions of Windows, including Win 8.1. Does the PDF Security Remover tool remove restrictions from corrupt files? No. this Adobe PDF Unlocker does not recover or remove restrictions from corrupt password protected PDF files. Is the PDF Encryption Remover software supported to unlock Adobe Acrobat 11 created files? Yes. The software efficiently removes restrictions from files, created on any versions of Adobe Acrobat. Does the Adobe PDF Unlocker software required Adobe Acrobat to unlock Files? Yes, Adobe Acrobat is required to perform Unlock action. Can I Unlock PDF files for free by PDF Unlocker Software? Yes, the software is free to download, use and unlock PDF document. But free demo version will add the Company watermark on the unlocked PDF file. Can I use this PDF Password Unlocker Software to copy data from file? Yes, PDF password Remover unlocks secured copy, print and editing restrictions from a document. Can I remove owner level password by Adobe PDF Unlocker software? Yes, our PDF Encryption Remover software removes both owner and user level passwords. What customers-say when it comes to unlock secured PDF File. First I tried free demo version of Adobe PDF unlocker tool, that has proved to be of the great help to me to Unlock PDF files by removing owner level restrictions. Using full version of this tool I can now access all my restricted PDF files which had been deemed impossible. Credits to the developers. This is the one of the best software to remove PDF password restrictions, I liked the batch PDF Unlocker mode that helped me a lot to free protected PDF from all kind of restrictions. When it comes to the working of software, just in few seconds I was able to unlock all selected PDF. Hats off to the developers! It is really amazing how the software efficiently unlock password protected PDF files within no time keeping the meta data intact. Unlock PDF Tool has removed all type of restrictions that enable print/edit option efficiently. I got fed-up removing PDF file password one-by-one. I google to download the best software to remove PDF password protection. Downloaded few of them and found that this PDF Restriction Remover tool the best one, helped to unlock multiple PDF files in batch without any hurdle. With this Mac PDF Encryption Remover, a user can easily remove restrictions from PDF document on Mac OS. It enables the user to copy, edit, print, extract, comment, sign & perform the document assembly of PDF files. 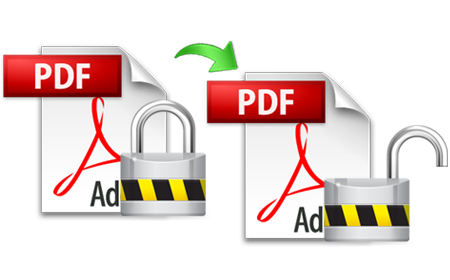 Once the tool remove security from PDF document, users can easily perform multiple operations on unlocked PDF. Adobe PDF Security Remover for Mac allows users to disable PDF protected mode in batch. This tool allow users to remove security from multiple PDF documents. However, in order to unlock PDF files in batch, it is required to purchase the business or enterprise license of the Mac PDF Password Unlocker tool. The software is very simple and easy to use. 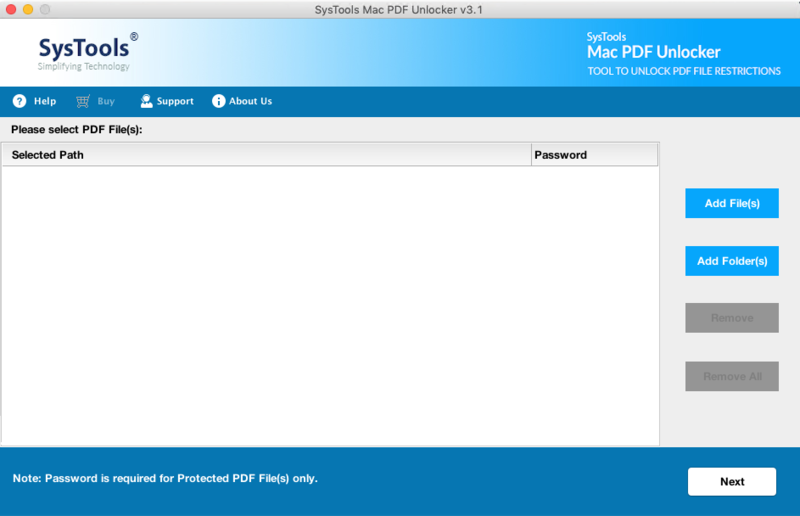 The Mac PDF Unlocker software easily remove password security from PDF document. If the file is having user level password security it can be easily eliminated by this tool. Initially, the user has to enter the appropriate password & once the file gets unlocked by the software the resultant PDF document becomes password free. This PDF password unlocker Mac generates the preview of all permissions associated with PDF document in Before & After column. As the files get uploaded the tool will list all permissions present in PDF file. However, once the tool permanently unlock PDF files, the permission status gets changed accordingly. The Mac PDF Unlocker Software is compatible with all versions of Mac operating system. The supported editions are Mac OS (10.13) High Sierra and all the below versions such as Mac OS Sierra (10.12), OS X EI Capitan (10.11), Mac OS 10.10 (Yosemite), 10.9 (Mavericks), Mac OS 10.8 (Mountain Lion) etc. 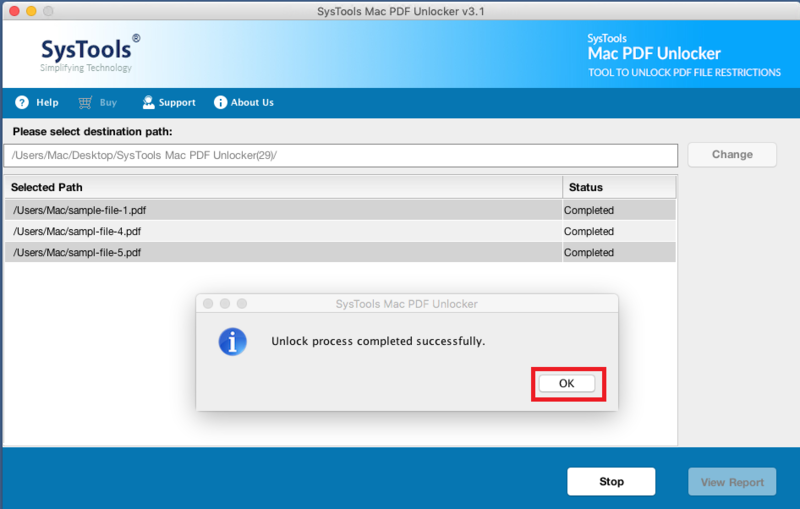 After the completion of PDF Unlocking process, the Mac PDF Unlocker Software provides an option to save the unprotected PDF document. The resultant PDF file can be saved at any desired location based on users choice or create a new folder directly from the software panel itself. Take a Vision on the Steps to Unlock Protected PDF Files. Is there is any limitation on the number of PDF files to be unlocked with the demo version of the tool? Yes, with the demo version of the software, users can’t unlock PDF files in bulk. Demo version can only remove password security from a single PDF document. 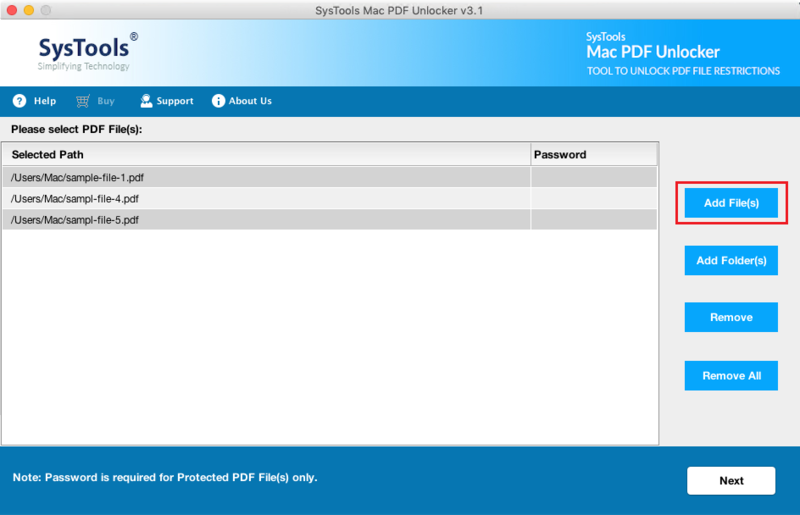 But, the full version of the Mac PDF Unlocker tool remove security from multiple PDF files. Does PDF password remover for Mac requires the installation of any external utility to unlock protected PDF file? No, it is a standalone software & it does not require the installation of any external software to unlock PDF files. Can I use this PDF password unlocker tool to remove PDF protection on Mac OS Sierra? Yes, of course, you can easily unlock protected PDF files on any Mac operating systems. The tool is compatible with Mac OS Sierra (10.12), OS X EI Capitan (10.11), Mac OS 10.10 (Yosemite), 10.9 (Mavericks), Mac OS 10.8 (Mountain Lion) etc. How this Mac PDF Unlocker tool remove PDF password on Mac machine? The tool to remove password security from PDF document requires a few steps to be followed. Firstly, the user has to enter the secure PDF password & after entering it the Mac PDF Password Remover tool will unlock PDF files and makes is password free. What customers-say when it comes to Unlock PDF on Mac OS X.
I would definitely suggest Mac PDF Unlocker tool to all those users who want to remove password security from PDF permanently. It is a complete solution which can delete password & remove restrictions from PDF document. The graphical user interface of PDF password remover Mac is very simple and easy to use to unlock protected PDF file. All the steps are self-explanatory due to which it becomes more easy to run the Mac PDF Encryption Remover. I tried Mac PDF Security Remover tool to remove restrictions from PDF document. I must say it is an amazing application that can unlock PDF files for copying, printing, editing, extracting, etc. The simplicity and efficiency of PDF Password Remover Mac make it best. There are many applications available to unlock protected PDF file. But, no one is more reliable than Mac PDF Unlocker software.